I'm a technology pundit. I claim to be internationally-beloved, but if you challenge me on it I'll change the subject entirely and talk about my regular columns for The Chicago Sun-Times, Macworld, The Mac Observer, my series of best-selling tech books for Wiley Publishing, and my regular appearances on The CBS Early Show. If that fails, I'll show you my Red Cross donor card. Can you possibly not like somebody who regularly donates blood? If so, then I don't even want your approval. I’ve been a writer for way too many years to put any stock in any sort of “I just wait for Inspiration to strike me and then it’s as though I’m merely a passive conduit for my Muse” self-pose. That’s the fantasy of someone who wants to write but never will. In truth, you’ve got to put your hands on the keyboard and keep pushing the cursor to the right and hope that you wind up with the kind of garbage that can be composted into something valuable, over time. Which isn’t to say that you’re in full control of the process every single time. My version of the former high school jock’s story about how he once scored four touchdowns in a single game is the day I got a great idea the moment I woke up and had 16,000 words of my next book finished by dawn the next day. Yes, I was clearly in the zone that day and as soon as I pulled my MacBook off the nightstand and into my lap and sat up, I knew that I was going to be making huge progress on something. Well, I spent some time — way too much time — this morning imagining Disney owning the rights to the Velvet Underground’s entire catalogue and preparing a tribute show for the theme parks featuring classic Disney characters. I went back and forth a while before deciding that Donald Duck should sing “Heroin,” and not Goofy. Then I fixed myself some lunch and realized that Donald Duck was okay, but Daffy Duck is clearly the only correct choice. “Heroin” is all about the tempo’s slow, patient burn and its eventual disintegration into explosive chaos. Daffy’s a proven master at this sort of material. By the time I finished my sandwich and cup of mini-pretzels, I had imagined Elmer Fudd on “Femme Fatale” (with Bugs Bunny coming in on the harmonies, in drag) and concluded that I didn’t want to go forward on this album unless we could move the whole project to Warners. So the point of this story that a writer’s daily toil is to pursue an idea with diligence, without any assurances that the labor won’t further their professional or personal goals. Some days, the process yields a whole five percent of your next book, done and dusted in a single day. On others, you will wind up with a solid idea that you can’t monetize properly until many, many, valuable bits of intellectual property fall into the public domain. Flo and I had a good time recording the first episode of the year. Maybe because it’s still close to the holidays and there hasn’t been any really terrible Google news to talk about yet? Whatever! Yay! No terrible news! Instead, we’ve got news about two of Google’s most interesting works-in-progress: the Fuchsia operating system and those neat little Project Soli radar modules that could enable brilliant new touchless interfaces. Stream it from our podcast’s official page on Relay.fm. Better yet…go there and subscribe. Waymo’s CEO said back in July that Waymo’s software had driven five billion miles on simulated roads and traffic. Its real cars had driven eight million miles on real roads, for real. There’s no question that Waymo is way ahead of everyone else in the development of self-driving cars. And yet if the goal is to make an autonomous driving system that can transport people from doorstep to doorstep via roads that are also open to human drivers and pedestrian, Waymo isn’t close. Five billion miles in simulation is just table stakes. Engineers can only simulate what they can predict. Human behavior is utterly unpredictable. I imagine that you’re expecting me to make a joke about irrational Boston drivers after that line. Oh, sweetie. Honey. No. It’s true that our moves are mostly dictated by Brownian motion but that’s not the real problem. To truly gape into the maw of madness, you need to look at our network of roads. Most of them were initially laid out by either cows looking for grazing land or 17th and 18th-century Puritans walking to church. Would you trust either species to design a backyard patio? I don’t think so. We think about this often, especially when we’re trying to find a way out of an entire neighborhood whose streets are all one-way and end with “Right Turns Only” signs. But that’s not Waymo’s problem. Not yet. One of the big challenges they’re confronting during their wide test program in Arizona is how the presence of marked autonomous vehicles changes the behavior of other cars on the road. A Waymo self-driving van cruised through a Chandler neighborhood Aug. 1 when test driver Michael Palos saw something startling as he sat behind the wheel — a bearded man in shorts aiming a handgun at him as he passed the man’s driveway. The incident is one of at least 21 interactions documented by Chandler police during the past two years where people have harassed the autonomous vehicles and their human test drivers. People have thrown rocks at Waymos. The tire on one was slashed while it was stopped in traffic. The vehicles have been yelled at, chased and one Jeep was responsible for forcing the vans off roads six times. “There are other places they can test,” said Erik O’Polka, 37, who was issued a warning by the police in November after multiple reports that his Jeep Wrangler had tried to run Waymo vans off the road — in one case, driving head-on toward one of the self-driving vehicles until it was forced to come to an abrupt stop. His wife, Elizabeth, 35, admitted in an interview that her husband “finds it entertaining to brake hard” in front of the self-driving vans, and that she herself “may have forced them to pull over” so she could yell at them to get out of their neighborhood. The trouble started, the couple said, when their 10-year-old son was nearly hit by one of the vehicles while he was playing in a nearby cul-de-sac. “They said they need real-world examples, but I don’t want to be their real-world mistake,” said Mr. O’Polka, who runs his own company providing information technology to small businesses. There can be no rational reason to attack any vehicle that’s carrying people (remember that these Waymo vans are often carrying passengers and there’s always a safety driver at the wheel). But there are legit safety concerns about sharing the road with these experimental vehicles. A pedestrian was killed by an Uber autonomous test vehicle in March. Investigators eventually learned that the accident occurred because the human being who was placed behind the wheel to oversee the safety of the vehicle was instead overseeing an episode of “The Voice” on her personal phone instead. But that doesn’t dismiss concerns about safety. A car that can be equipped with enough sensors to navigate a road and react to what’s going on can also be equipped with sensors that detect that a safety driver isn’t actually watching the road. So why was this kind of accident even possible? The software can also be very, very annoying for other cars. Experimental self-driving cars all drive like student drivers who got their learners’ permits a week ago and are driving the family’s “good” car. We enter a complicated intersection and make the right move instinctively. Self-driving cars stop and think and wait for a situation to become more clear. They make, like, 18-point turns sometimes. But hey, these are all “experimental technology” problems. Put enough miles on the odometer and they’ll all get solved. I’m more interested in the dangers created by human behavior. We’re all bound together by a mutually-supportive social contract. And somehow, we leave that contract on the other side of the door when we get inside a car. I’m walking on the sidewalk and I nearly bump into another pedestrian. Invariably, we both apologize without even thinking about who might have been at fault. Why? Because it’s impossible not to identify that meatsack as another human being. It triggers all kinds of genetic programming that helps us all get along and not kill each other. Subconsciously, we emphasize (“hey, these things happen”). We also understand that yelling or shoving could have consequences. Whereas when you trip over a curbstone you can yell at it all you want. Curbstones have zero empathy. This means that you can’t possibly hurt its feelings. It’s also why they can keep right on tripping people day after day without feeling any remorse. Drivers who are prone to road rage might understand intellectually that the car that just cut them off (or is merely heeding a “No Turn On Red” traffic sign) contains a human being. But emotionally? Naw. It’s a car. Yell all you want and blow your horn! Maybe even scare ’em! Why not? I mean, there are even psychos who throw big rocks off of highway overpasses. Yet dropping big rocks onto busy pedestrian thoroughfares doesn’t seem to be a widespread thing. Those with plenty of faith in humanity would say that it’s because identifying with the potential victims is unavoidable. The cynics would say that getting identified would be unavoidable. Either way, people don’t do it. So I wonder. Will road-ragers be even angrier and more aggressive against driverless vehicles? Brake-checking a Waymo or even forcing one off the road might seem like kicking a Coke machine, despite the obvious consequences for other people. I can’t relate to that kind of thinking. Even when I owned a car, I never felt any road rage. How about a different form of this same question: can a drive be expected to show a driverless car the same courtesy as one piloted by a human? Again, it’s a question of empathy. I know how much it suuuucks when your exit is coming up and you’ve been signaling your lane change for a mile and nobody is letting you in. Would a Waymo car push that same “Be Kind” button in my head? I dunno. Let’s get back to Waymo’s problem. I’ll explain. When a fight breaks out during a pro hockey game, it’s not usually a case of two random players losing their tempers and throwing down. No. Some players are recruited into the NHL from the minors because they’re great enforcers, not because they’re great players. “Ice Guardians” is a fine documentary about the history and role of hockey enforcers. It’s on Netflix. The Enforcer (“goon” is impolite) is part of the game. Today’s players are so well armored that it’s tactically worthwhile for a defenseman to take a fifteen minute penalty if it means removing the league’s high-scorer from the game entirely. The math on this choice changes radically if that same defenseman knows that the opposing team’s roster also includes the league’s most efficient enforcer. A fighter who reputably once punished a player so severely that it changed his eye color permanently and they had to go to the DMV to have a new driver’s license issued. If a Waymo car is getting roughed up out there, it’ll transmit the offending car’s license plate and visual indentifiers to the network. The nearest Waymo Goon Car will plot an intercept course, pull up alongside, and administer a Corrective Action to the car’s bodywork. Even days later, if necessary, relying on APB reports sent out to other Waymo cars’ software. The Goon Cars won’t receive the usual top layer of gloss coat. An Impala carrying the paint smears of a Waymo Goon’s signature colors will continue to caution other drivers long after the actual incident, just as the panic scent of an actual impala being torn apart by leopards warns the rest of the pack to maybe…you know, just chill. It sounds like an extreme response, but really, once these Waymo Goon Cars have established their reputation, the highways will be safer for everybody. In return for this innovation, I expect nothing but a reasonable per-vehicle licensing fee and the plaudits of a grateful nation. Someday, you’re going to spot on online deal for an external drive at a time when you happen to be flush with cash and with no financial perils on the horizon. You should buy that drive. When it arrives, stick it in a closet. Don’t even open the box. Why? Because having a fresh, empty drive empowers so many solutions to PC problems. As I write this, I’m helping a friend recover from a dramatic interlude between her MacBook Pro and a mug of hot water with lemon. The laptop is, well…donezo. But! She has a Time Machine backup. I erased a 500 gig external SSD, installed a fresh OS onto it, and am performing a restore. It’ll be a few days before she can get her lemon-soaked MacBook diagnosed but she’ll be back to work long before then. Her old MacBook Air’s internal drive is way too small so she’ll use my SSD as a boot disk. This is the same SSD that saved my bacon when my own MacBook Pro’s SSD died a month or two ago. If I hadn’t had an uninitialized drive standing by, getting it back up and running would have been a nonlinear process involving a nonzero amount of angst. Option 1: Order a new external drive. I’d have been without a working Mac for a couple of days. And spending a couple of hundred bucks to build a bootable external drive from my backup wouldn’t have been attractive, given that I was already going to be on the hook for X dollars to replace my Mac’s faulty component. Option 2: Skip the stopgap solution and replace the internal SSD straight away. This would have been the obvious answer if this were any other $2000 laptop. Alas, I am blessed with an Apple product. This blessing is accompanied by the unavailability of standard upgrade and replacement components. I’m lucky that my 2015 MacBook Pro was the last model in the line where the SSD is even swappable. Still, I needed some time to do a little research and figure out the right solution. But I had a fresh, empty 500 gigabyte Samsung SSD standing by. I did a restore and was back up and running after only an hour or two of downtime. I took my sweet time investigating the fix for my MacBook and not only found exactly the right answer, but also a replacement SSD that was 30% off during a one-day sale. This advice isn’t complicated, is it? If you have a huge drive with nothing on it just standing by like a fire extinguisher or a manila envelope with $5000 in cash and three different sets of identity cards, you’ve got a solution to any number of problems. I was about to list a few but trust me: you’ll know them when you see them. Oh, and BACK UP YOUR DAMN DRIVE. Both my friend and I went through our trials with our respective elan relatively intact because in the worst-case scenario, we were only losing a little time and money. If we didn’t have backups, our most productive avenue would have been to try to get Superman to fly circles around the Earth so fast that it spins in the opposite direction and we can go back to the day when our MacBooks were still healthy. He would have done it — because he’s Superman — but he would have scolded you with the same admonition about backups that I just gave you. Better to learn it now and not owe Superman a favor. Happy New Year to all. Take some time to make a list of every good, healthy, positive, and/or admirable thing you did today. And then take some time to reflect on the fact that you’ve maintained an unbroken streak of doing all of those things every day all year so far. Good for you! I’ve posted to my blog every day this year! I’ve taken and posted a photo every day! But I haven’t shaved yet. I’ve given it some thought and concluded that doing so would set up some unreasonable expectations for Wednesday. Today is Comicraft’s annual New Year’s Day Font Sale. It’s not accurately named. As usual, they cut the price of each of their fonts down (to $20.19) early last night, and if they keep to form, the sale will continue well into January 2. That doesn’t mean you should dilly-dally! If you put it off and miss it, that’ll be a damned shame for you and for anybody who sees your presentations or labels or business cards or your passive-aggressive signs in the office common breakroom about “the right way” to put the carafe back on the coffee maker. Check to see if the font you’re about to buy has both upper- and lower-case letters. Some are upper-case only. They’re still fab, but the font might not suit your purpose. Also check to see if a font comes in several thicknesses and not just Bold and Italic. These are hugely useful, particularly when you combine several thicknesses on one page. Each of these fonts is the same price. You might as well buy the “International” version (with bonus characters & symbols), which usually costs ten bucks more. Don’t use the “guest” mode when checking out and paying. If you create an account, you can re-download any of your purchases at any time. Last night I looked for Comicraft fonts that were missing from my MacBook and retrieved ones that I’d bought almost ten years ago. Which fonts should you start with? Beats me. I mean, why are you buying these things? The Comicraft sale pays off most bigly when you’ve identified a specific need. I bought one or two this year with a website redesign and a new business card in mind, for instance. Comicraft made its reputation on its professional handlettered-style comic book fonts. It seems a shame not to add one to your library. Comicrazy is my favorite, but they’ve got loads of styles and each one has its unique strength. Monologous emulates the lettering of classic comics from the Sixties through the Eighties. And yes, I’ve spent way more time writing new and frequently inappropriate dialogue for old Fantastic Four comics than I care to admit. Get a font explicitly for making signs. Sign Language is an obvious pick. Dash Decent is one of the all-stars in my Fonts menu. It’s my go-to when I need a sign for a bulletin board or a label for a utility drawer. Get a font for that kind of lettering that just plain can’t be faked. When you want dramatic, swoopy letters, you need either Spills or you need to come up with another idea. Invitations for a Harry Potter, Lord Of The Rings or Game Of Thrones-themed party require Spellcaster. And: your heart was in the right place when you used Helvetica Bold for the sound effect overlays in your kid’s hockey team’s season-recap video, but it looked totally lame. For Batman-style text, go straight to Biff Bam Boom. But not Andy Ihnatko. On previous occasions when I exhibited this kind of commitment, people said that Edwin Abbey should have immortalized my struggles in a magnificent mural sequence at the Boston Public Library, and not Sir Galahad’s. They’re right, of course, but I suppose Abbey’s hands were tied; he died several decades before my father was born. Second-off! A shout-out to Edward, the Lyft driver who got me to the train station. His radio was tuned to WGBH when I got in and when he asked me where I was headed from the commuter rail station, he was happy to tell me how much he and his wife enjoyed Boston Public Radio and Margery in particular. Honest to God, buying new fonts on New Year’s Day is as big a holiday tradition for me as Patrick Stewart’s audiobook of “A Christmas Carol” and making big plans about making and sending custom Christmas cards but not following through. “Comicrazy,” because not getting a professional, hand-lettered-style comic book font seems like a shame. Comicraft offers plenty of ’em, each with their own unique charm. “Comicrazy” is by far the most expensive of them, at $395. “Sign Language,” because it’s the only answer you need when it’s time to make a sign or a label or a placard or something. The package includes several thicknesses. But by all means, hit the site and browse, browse, browse. I’ve already filled my shopping cart with a few of Comicraft’s 2018 releases. One of them is earmarked as the masthead font of a new site I’m building. When January 1 hits, the prices will be automatically updated and I’ll just click one button. What’s better than getting a $395 font for $20.19? Getting all of the books, movies, music, poetry, paintings, etc. published in 1923 for free! January 1, 2019 — the first release of new material into the public domain in over two decades — has been as eagerly anticipated as The Rapture. Well, surely that’s an awkward analogy but let’s just roll with it. Open Culture isn’t so much a library as it is a blog about public domain and other free media. And, honestly, any Google search for [“public domain day” 1923] turns up lots of blog posts of people’s individual favorites entering the public domain on January 1. Phone batteries naturally lose capacity as they get older. If your iPhone is a couple of years old, getting a brand-new Apple-branded battery installed by Apple for $29 is a steal. Set up an appointment at your local Apple Store’s genius bar sooner rather than later. Disgraceful. The iPad Pro is a premium product and purchasers shouldn’t just take Apple’s word for it that a visible bend won’t eventually lead to hardware failures. If you’ve bought an iPad Pro in the previous two weeks and there’s a visible bend, return it for a full refund within Apple’s standard 14 day return window. If you bought it before that…well. Just hope for the best. And reflect on the many, many times Apple fans have quoted Steve Jobs’ line about craftsmanship and pride and making sure that even the paint on the side of the fence nobody will see is perfect. But! Good news if you bought it between November 14th and December 24, you can return your iPad (or anything else you bought from Apple during that period) as late as January 8. My friend Paul has kindly reminded me of Apple’s annual Holiday return window. Amazon’s Alexa Had A Meltdown In Europe On Christmas Day Didn’t get to it! …Which was embarrassing but not entirely unexpected on a day when hundreds of thousands of people were trying to activate new Echo devices at the same time. The app asked for the Alexa device’s IP address and serial number. What the app’s creators are doing with the data they collected is anybody’s guess but it can’t be good. Folks who downloaded “Setup for Amazon Alexa” can be forgiven for not noticing that the developer’s name was “One World Software” instead of something Amazon-ey. This is just a reminder that there are stinky people out there and many of them are trying to trick you into downloading their app instead of the one you were looking for. Check for the developer’s name, the app’s history, and number of downloads. I agree with the central point. People aren’t giving up their personal data because they don’t care or they’re unaware it’s happening. They’re doing it for the same reason why we all pay “convenience charges” when we buy tickets to shows: we feel like the whole system is stacked against us and it’s part of this vale of tears known as Life In 2018. And that was absolutely the right call. In the Nineties. Now, we’ve seen what happens when an industry is allowed to operate unregulated, practically. Just as their came a time when the coal industry had to be explicitly told not to hire eight year old children, the time is coming when Facebook, Google, and every digital marketing platform is going to be told that there are going to be some Rules, going forward. Switching from a Smartphone To a Dumbphone Didn’t get to it! Though of course there’s always going to be a way. Most modern featurephones regard a Facebook app as being about as negotiable a feature as the “7” key on the dialing pad. That’s all. My music while writing this little bagatelle was this recording of “Lucia di Lammermoor,” featuring Diana Damrau and Joseph Calleja. This week on Material: Google is Naughty (not treating contract workers with respect, trying to patent an MIT Media Lab researcher’s ideas after interviewing her for a job) and Nice (giving Santa a digital place to hang out and mingle). Also: the correct pronunciation of the word “Fuschia” does not come naturally to me. I’m on this week’s Download with my old friend Jason Snell, Rose Orchard, and Jeremy Burge. The weeks’ nerd news in review, in which I am so very relived to learn that I’m not the only one who has to mute the TV whenever I’m navigating Netflix. What is it about those auto-rolling trailers that stresses me out? It’s as though my brain has only one input channel for formal language. I’m reading the descriptive text to see if I’m interested in this show but then audio dialogue begins and GRRRT! I’m jerked violently into another brainmode. A photo project for a waiting audience doesn’t ship when it’s done. It ships when…okay, I hadn’t really thought the rest of this sentence out. I know it involves wanting people to see your photos while they’re still relevant. Self-loathing certainly factors in there somewhere, too, but then again doesn’t it always? Here are my photos from Providence Roller Derby‘s Spring opener on April 7. Check ’em out on Flickr. There’s a fresh rumor about Apple selling Macs that use custom ARM CPUs instead of Intel silicon as early as 2020. I wrote a breezy 1600 words about it for Fast Company. I like this rumor a lot. Apple making custom CPUs for Macs makes perfect sense. I don’t think Apple would drop Intel completely. It’s easier for me to imagine them using custom CPUs for their consumer-grade Macs and sticking with Intel for the high-horsepower Pro desktops and notebooks. At least for starters. Remember that iOS and MacOS are built on the same foundation. During my very first briefing on the iPhone, Apple told me that the iPhone’s OS is OS X with none of the stuff the Mac needs and all of the things a phone needs. ARM is such a huge move — and presents such a big opportunity for change — that I would expect it to accompany a whole new historical age for the Mac. Either Apple would do radical (and long-overdue) modern rethink, akin to what Microsoft did with Windows 10…or they would effectively transform MacOS into an enhanced version of iOS, in function if not in name. As much as I like this rumor, I’m still cautious. Apple tries lots of ideas and builds lots of ready-for-market hardware before they commit to anything big. I’ve no doubts whatsoever that there are a whole bunch of ARM-based Mac laptops inside the Apple campus, and that an ARM version of MacOS is done and dusted and has been for some time. But even if someone leaked Apple’s entire WWDC keynote slide deck to me a week before, I refuse to believe any rumor until Apple formally announces. Do read my whole Fast Company piece. Quick update: I was informed today that I am no longer a Chicago Sun-Times columnist or contributor. So let’s spread the word on that. Sure, because I’d love for another publication to snap me up as the immensely hot property I am in time for me to debut with my coverage of next week’s Apple Event, but mostly because I’m certain that the Sun-Times would appreciate my doing that. Where to, next? I dunno! I’m kind of a fan of being part of a larger outfit. 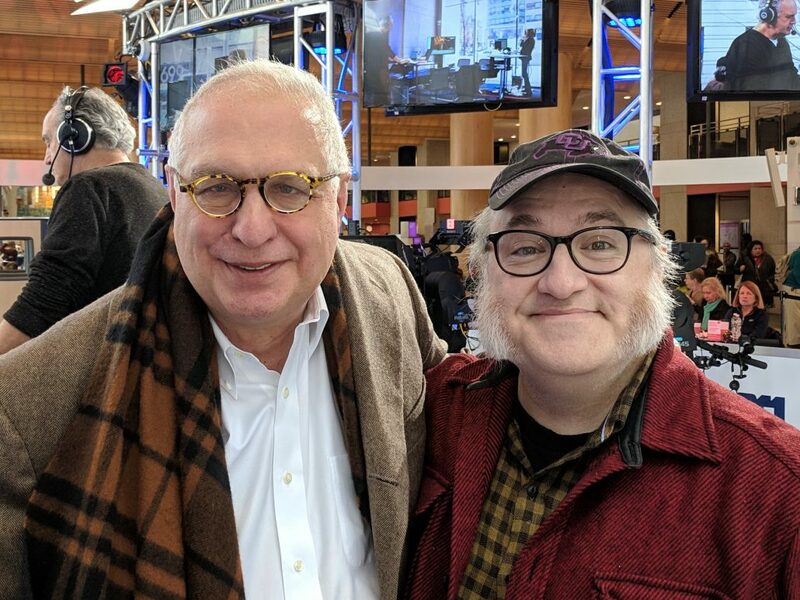 I loved being a Sun-Times columnist (and will always be proud of the work I’d done there since 1999) and part of the fun was living up to the legacy of the great writers who came before me and were being published beside me. I like health insurance and stuff, but freelancing is fine. I was freelance for the Sun-Times during my whole tenure. Ability to publish with great agility. One of my few troubles with the Sun-Times was associated with understaffing. The editors are great folks who work very hard and are stretched quite thin, which often meant that my columns would take days to appear on the site. I’d love to be able to just write something quick and timely and have it in front of people shortly after I pressed a button on the CMS. Willingness to publish long, thoughtful stuff, too. I’m only just now getting around to writing about this year’s smart speakers because (a) I didn’t want to be part of the initial marketing scrum and (b) it’s actually taken me a good while to figure out what I think. I have huge respect for my friends at iMore and other sites, whose skills are well-suited towards getting valuable coverage out there almost simultaneously with the events unfolding. My skills are elsewhere. Nonetheless, I’m battle-hardened for getting out something quick in response to breaking news, and I would have published SO many quick 200-300 word bits for the Sun-Times if I had publishing privileges on the CMS. But! Honestly, I don’t want to have to know how many clicks something is getting, or be raked over the coals for not getting more of them. I reserve the right to make up a word if I can’t fromate one that suits the immediate need of a sentence. This is where heroes step in and fix the inadequacies of the English Language. And I’d like to receive enough trust that I can just provide X columns per week or month. I hate pitching. By the time I’ve convinced somebody that a thing is worth publishing, I could have already written it, and if I’m writing it, I want to get paid for it somehow. It’s a vicious circle. I got my first regular magazine column in 1989. Ever since, my professional goal has been to do for tech what Roger Ebert did for movies. Yes, that was his beat, but what made Roger indispensable was his point of view. When the cast of an upcoming movie is announced, hundreds of sites scramble to post 300 copies of the same information. That’s fine. Roger wasn’t part of that land rush, though. Roger’s take on something was always worth reading, and there was only one writer who was posting it: Roger Ebert. To do anything as well as Roger did is impossible. But my aspiration to consistently write with that kind of purpose, and to deliver that kind of value, will always be there. The Sun-Times isn’t — wasn’t — my only source of income. I’m fine. So if I can’t find another columnist-type gig…who knows. Maybe I’ll just post stuff right here. It’s a solution that ticks all of the above boxes except for the first one. Maybe if I establish a routine here, I’ll look for sponsors. Or maybe I’ll give Patreon a go. Or maybe I’ll become a ronin, honing my skills and purifying my spirit as I work for a series of outfits that need my swords for a specific task. In any event! I send my thanks to all of my former editors at the Sun-Times over the past fifteen to twenty years. And I’m still tech contributor to WGBH public radio here in Boston, and I’m still co-hosting podcasts with my friends on MacBreak and Material. (my last name) at gmail.com. My old Mercury Sable, no virgin when it came to riding on the back of a flatbed truck, took its last such journey this afternoon: it left my driveway for good at around 2 PM. She carried me faithfully and reliably for over 90,000 miles until a few years ago, when those three jerks at two separate garages told me the front suspension could one day collapse while taking an offramp at speed. Or some other such nonsense. The Sable was my Dad’s car. That’s probably why I kept it for so long after I took off the plates. Every time I’d arrive home and see “his” car in my driveway, I’d think “Oh! Dad’s come to visit!” Even though, of course, Dad only ever saw my driveway in pictures and videos. I bought it from his estate after his stroke, when he’d moved to the care facility where he died a year or two later. Dad’s car helped me heal. I felt pride in taking as good care of “his” car as he would have. Through careful driving, and regular maintenance, I rolled its odometer to nearly 180,000 miles and the engine was healthy right to the end. During that time, the only damage it ever incurred was due to a careless parker (broken mirror, deep crease to driver’s side door and front fender) and a lady who merged into my lane without looking (more damage to the front fender, including front headlight). There was a certain correctness, too, in the fact that (as a journalist who works out of a home office) the only period of my life when I had a long, regular commute and I truly needed a car was when Dad was in that care facility. It was about a ninety minute drive from my house and I made that roundtrip two to five times a week for more than a year. I was still processing my Mom’s death during Dad’s illness. Dad’s stroke had left me with plenty to process on its own. I did a lot of thinking about my parents during those commutes. It was ages before I even chose to move any of Dad’s stuff from the back seat or trunk. I suppose it’s now safe to admit that during the week when we knew that Dad was in his final days on this earth and we were spending every hour either in his room or in the lounge across the hall, I set a career-best land speed record in the Sable. At a certain point I desperately needed to go home for a shower and a change of clothes, you see. I zipped home and zipped right back, praying all the while that I wouldn’t miss anything horrible while I was gone. I-95 was totally deserted at 2 AM and I felt like I wasn’t endangering myself or others. I also figured that if worse came to worst, the excuse I was carrying was strong enough to convince a state trooper to end our roadside transaction with a scolding and a ticket instead of Miranda rights and handcuffs. If I’m honest, I also needed to blow off some of the week’s tension. Suffice to say that the speedometer needle went places that I’d never taken it before; after rotating past a certain point, the needle began creaking like the spine of a brand-new book being opened. It indicated just how much tension I’d accumulated after three days in a room with my family, keeping myself together while supporting my sole remaining parent’s transition into death. I loved Dad’s Sable. Alas, two or three years ago, I saw the writing on the wall. As well as the writing on the report from its final, failed safety inspection, parts of which had been underscored urgently in ballpoint. Still, its sentimental connection to Dad forced me to at least think about fixing its rusty suspension. The old car had already surprised me by starting up and running reliably even after 175,000 miles, even after a week in an airport parking lot at subfreezing temps. And, thanks to some new driving techniques I picked up after installing a dashboard fuel economy meter, that old Sable consistently got 25 to 30 MPG…well above what the factory sticker promised. What a coup if it made it to 200,000 miles! But…that would’ve been the second time I’d kept the Sable going by phoning around junkyards to locate an old part that my bless-his-soul mechanic couldn’t find in any conventional inventory or catalog. All of the bits of the Sable that were meant to be replaced every 75,000 and 100,000 miles had already been replaced at least once and were probably going to fail again soon. The underbody rust wasn’t limited to just that one part of the suspension, either. No, it was time for the Sable to go. And it was time for me to let it go. Of course, if I’d let it go within a year of parking it, before its quarter tank of remaining gas had turned to shellac and its engine compartment had become a winter shelter for various neighborhood critters, I probably could have gotten at least five times as much money for it. But it’s not as if I didn’t get any joy out of the Sable during its final two or three years as a driveway art installation. Today, I watched it go. I felt a deep sense of nostalgia, but no sadness. I’ll use this check to buy opera tickets. I’ll wear one of Dad’s ties when I go. Right at this moment, writing that sentence, I realized that the production I want to see is running right around the week of Dad’s birthday, too. Well! Yesterday I had the prototypical Thanksgivin’ Dinner That Couldn’t Be Beat. This time it was with my family and it was up there with the greatest. Holidays are a teensy bit weird when you have lots of siblings and then both of your parents have passed away. We grow up, we move out, we start our own families, but the folks remain the sun around which our planets orbit. On holidays, Mom and Dad become like the Olympic site selection committee. Whether it’s Thanksgiving or Christmas or National Poached Egg On A Waffle Day, the house where they choose to spend the holiday becomes the location of The Family Holiday. So what happens when that center goes away? Do the planets spin off in directions that take them farther and farther away from each other? Does one of them become the new center? It’s been several years since we lost our parents, and we seem to have settled into a good system: “it’ll all work out.” There are plenty of siblings to go around and nobody feels pressured into getting locked into a non-negotiable tradition, whether as a host or as a guest. This year, I spent Thanksgiving with two sisters and their accompanying retinues of spouses and kids. I was looking forward to it and the experience delivered. Other years, I’ve done Thanksgiving with friends, or even spent it alone, and the siblings never interpreted it as a middle finger extended heartily in their direction, no more than I did when they had plans that didn’t include Andy at the table. Overall, I have the luxury of making my own choices for the holidays. I know that not everybody has that kind of freedom and I’m grateful for it. Is it appropriate to say “Happy Black Friday”? Probably not. Big business has done what it does best: they’ve taken a tradition that grew organically out of a collective semi-pleasurable desire, and turned it into a giant Nerf gun of stress-darts. …And then closing the trunk and returning to the mall. I was younger and much less mature. Also, Massachusetts has strict gun laws. Anyway, I’ve a new Black Friday tradition: I tweet out links to Amazon deals I find for products I can recommend, and I do it like a madman. Yes, I have an affiliate account on Amazon. Every time someone clicks on one of those links and buys something — anything, not even the thing I linked to — I get a little kickback in the form of Amazon store credits. I never use affiliate links for tech items. I don’t think it’s unethical to use affiliate links that way. The Wirecutter has done that since the beginning, and there’s no reviews/recommendations site that I respect more. I just don’t think it’s the right choice for me. I’m not a website with a whole editorial board and other staff. I’m just this one guy, and I’m trying to do good tech journalism and reviews in a world where (and I wish I was kidding about this) a guy on a YouTube tech site gets a freebie $800 video gadget and he’s so grateful and so excited about how superawesomesaucewonderful the thing is that he licks it. In such an environment, it pleases me if I’ve given my readers/listeners as few reasons as possible to suspect my motives. And not accepting affiliate money for anything tech-related falls under that umbrella. But books? Movies? Music? The awesome razor I bought a few years ago that I utterly love? Sure! Fair game. So I apologize to anybody who (correctly) thinks that my Twitter feed is cluttered with material goods for the next week or so. Would it help if I told you that it’s all towards a higher purpose? Yes: an awesome new TV for my living room. See, usually, my Amazon Affiliates bucks don’t amount to much. It’s not a business. I don’t even consider it a sideline. Generally speaking, the monthly credits mean that if a book or a movie catches my eye, I don’t have to think too much about buying it. But in January, when the Black Friday credits are applied to my account…YAHOOO CLEMENTINE!!!! IT’S BISCUITS AND GRAVY FOR THE WHOLE FAMILY!!!!! When I need a new laptop, I spend the money and don’t think twice. It’s a tool I need for my livelihood. But when (say) the backlighting on the good TV in the living room is starting to go south and “Blade Runner” looks like it’s had a not-good Instagram filter applied to every frame…well, I mean, it’s still working, right? It’s in 1080 HD and color, isn’t it? Is it smart to blow a lot of cash on a new one? Yeah, it’s still annoying me. I want a new TV. And I want one that will serve the role of “The Good TV In the Living Room” for close to ten years, as this one did. Which means: 4K! HDR! A wireless remote control! The whole nine yards. I’m sorry and not sorry for having so many Amazon links in my Twitter feed. If it helps, imagine me in a few months, watching a movie that you deeply approve of, on a bitchin’ cinema screen without a grey halo around it for the first time in almost a whole year. If you’ve been moved to tears by the tale of this poor orphan boy, here’s an Amazon link to one of my favorite books. Anything you buy after clicking that link will count toward Andy’s Bitchin’ TV Amazon Kickback Fund.